Impossible Modernism: T. S. Eliot, Walter Benjamin, and the Critique of Historical Reason. Robert S. Lehman. Stanford, CA: Stanford University Press, 2016. Pp. xxviii + 241. $60.00 (cloth). 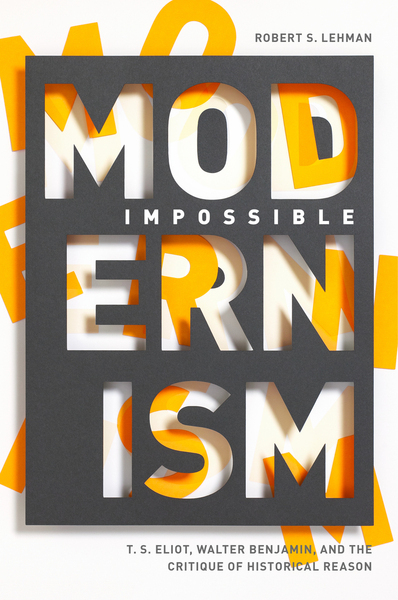 How modernism transformed the conditions of history is the subject of Robert S. Lehman’s excellent Impossible Modernism, a book that should change the way we do history in modernist studies. Lehman surveys recent and current historicist work in the field and rightly argues that “[i]n their eagerness to read modernism historically, critics have rarely paused to consider how history is read by modernism” (xv). We locate modernist texts within their historical contexts, interested in how they “respond (critically, ideologically) to the givenness of historical facts,” but without recognizing how modernist texts existed to question this very givenness (xiv). The problem is ironic, because modernism ask us to “rethink the very historicism [we] bring to bear on it,” and we ignore its most vital engagements with history by presuming them to be unmediated ones (xv). Theodor Adorno took Walter Benjamin to task for this kind of mistake. In his response to Benjamin’s “The Paris of the Second Empire,” Adorno complained of Benjamin’s omission of the “mediation by the total societal process”; in his “persistent tendency to relate the pragmatic content of Baudelaire’s work directly to adjacent features of the social history of his time,” Benjamin had failed to recognize that Baudelaire’s poetry (like many modernist texts) was no “unmediated reflection” of its history. It was no “wide-eyed presentation of mere facts” but rather a form of historical engagement (quoted on 157). Of course, Benjamin did know it, and Adorno was wrong about the mode of interpretation at work in the Baudelaire essay and in The Arcades Project. At work here was an anecdotal method designed precisely to revise dangerously naïve historical interpretation. Affirming it, Lehman mounts a defense of Benjamin, as one part of his superb account of the critique of historical reason Benjamin develops across his writing. This account proves that we must cease trying simply to relate the pragmatic content of modernist texts to adjacent features of the social history of their time and instead read these texts for their historical critique. Modernist writers inherited a form of history, developed across centuries of thought, about the relationship between historical and literary forms. Poetry and history had been coupled and contrasted in Aristotle, Marx, and Nietzsche (and their interlocutors) in such a way as to establish the standard nineteenth-century (or pre-modernist) view of what forms history might take. Throughout this tradition of thought was the persistent suspicion that “both poetry and history are centrally concerned with the relationship between universal and particular,” and with the urge to find universal structures for singular events (3). Could history be what poetry constructed? Modernist writers “enter the fray at a critical moment” in which this relationship had the potential to give poetry new life—“to produce, poetically, a history in which poetic production . . . is possible” (24, 23). A crisis in the very construction of history was a chance for the modernist writer to “bring history in line with radically innovative artistic or political goals” (as Nietzsche might have wished) and thereby to make history “the detour through which poetry begets poetry” (18, 23). How poetry could be reborn by shaping history was the question for modernist writers committed to this self-sustaining historical critique. T. S. Eliot developed just such a “thoroughgoing critique” of historicism by asking what historical models could make poetry possible for him (29). He pursued this question across a series of poetic modes: lyric, satire, and myth. What developed from first to last in these modes was a way for the modernist poet to give shape and significance to histories that might otherwise only have put poetry in crisis. In the lyric form of “Prufrock,” Eliot began to discover how to keep the vast quantity of history from overwhelming his mind, to solve the problem of “amputation,” whereby the individual, cut off from his own ability to write and think, “loses himself to history” (43). Lyric turns amputation to its advantage. It provides the means for “therapeutic self-division,” a split between the opposed faculties of the mind that correspond to the formal and empirical functions of history (33). That is, the mind of the lyric poet gets the better of history by modeling itself upon the structure of historical critique, in and through the differences lyric personae might adopt. “Tradition and the Individual Talent” develops a systematic explanation of this possibility, but not so that Eliot might rest content with it; his satirical work advances self-division toward a stronger literary form by taking a more powerfully negative view of history’s current excesses. To fully “secure our difficult passage from formlessness to form,” however, Eliot had to develop his mythic method (72). We know of course that this method was meant somehow to give order to the futility of history, but here—rethought with such rigorous ingenuity—the mythic method emerges as a truly viable literary-historical mode. Lehman gives us the definitive account of it, as a culminating “strategy of division” (92). Apart from history and therefore truly able to shape it, myth makes The Waste Land the essential modernist poem of historical crisis. Lehman’s other exemplary figure is Benjamin, whose anecdotal method is the second of the three modes by which Benjamin (like Eliot) developed a modernist critique of history. First was order—Benjamin’s effort to replace Kant’s transcendental philosophy with a “doctrine of orders,” which was able to explain how “what Kant presents as a structure of certain or timeless knowledge is in fact open to revision” (132, 133). Timeless knowledge is made historical in Benjamin’s doctrine of orders, asserting the “dignity of experience” (Erlebnis), achieving a “democratization and finitization” of Kantianism and thus a form for historical emergence (130, 132). The anecdote as Benjamin practiced and defined it was one crucial format for this experiential critique, important for the way it could deliver a materialist history without collapsing into mere empiricism. It was, in other words, a revised Kantianism, and it led the way to the third mode: Benjamin’s signature critique of history in allegory. Just as Lehman gives us the definitive view of Eliot’s mythic method, he has redefined Benjaminian allegory and, more specifically, the kind of allegory itself allegorized in Benjamin’s Angelus Novus. This Angel of History is “the perfect materialist historian,” a critical figure for history itself as modernist critique would have it, because it “sees history . . . without reading it,” destroying any specious narrative continuum, enabling history that is not temporally given but merely apparent to the allegorical vision (189). The Angelus is finally a “textual event,” an “inscription marking, without representing, the impossibility of a certain strategy of historical representation,” and this style of eventness makes it a figure for the “double vision” developed by the modernist critique of history—that which can see history as both empirical event and transcendental scheme and therefore a modernist opportunity (191). “[W]e inherit this inheritance”: what we ought to make of history is a problem Benjamin and Eliot themselves anticipated, making it hard for us to get the right perspective on them; indeed, figures for this history (inheritance) are the problem with it (193). But knowing that now, we must at least be less likely to simply take a “precritical prehistorical” view of history’s impact on modernist culture and instead struggle to recognize the modernist “struggle to grasp and transform the formal conditions of historical experience” (155, xiii). Lehman’s brief for that reversal is absolutely conclusive. Its intellectual power is remarkable and yet so refined that the argument somehow—in spite of its complexity—also has the most elegant lucidity. It will be the ideal model for further inquiry into similar or different ways modernists of all kinds sought to change history itself.